Meeting Program. 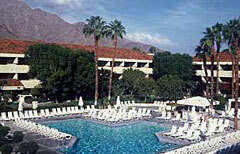 The 2007 SCEC Annual Meeting was held September 9-12 at the Palm Springs Hilton Hotel in Palm Springs, California. Meals will be served buffet style as has become the tradition at SCEC meetings. The Hilton is the same venue as the 2006 SCEC Annual Meeting. The meeting was organized by the SCEC Planning Committee, chaired by Greg Beroza. An agenda is available for download (PDF). Abstracts were submitted online and you can now search for abstracts below. In addition to the normal work of planning future activities, we again had several science talks during the meeting, with more time (at the request of many) set aside for poster sessions/viewing/individual discussions. A guide to the poster session is available for download (PDF). The annual meeting formally started on Monday morning and concluded at noon on Wednesday. The full volume of meeting proceedings and abstracts is now available for download (PDF). The abstract volume and abstracts of invited talks are also available for download (PDF).